Jochen Höfferer broadcasts live and interactively the meetings of the city council in Salzburg, Austria. Your registration is needed for our documentation and statistics. Link to the meeting room will be sent by e-mail to all registered participants 1-2 days before the webinar date. The meeting will be recorded and published here afterwards. Adult education organizers, NGOs, libraries, politicians, public authorities, and everybody with interest in this subject. Can we improve democracy through live participation online? Join NVL Distans webinar with experts on video conference systems and live streaming from two continents! Video conference systems and live streaming applications offer low threshold participation, transparency and interaction in political processes. In this webinar session David Röthler will moderate a discussion with two guests from two continents their experiences with the use of live video systems in political processes and forums. Garth Frizzel has been organising video conferences via “Google Hangouts” to talk with people about municipal issues that were affecting them in their cities. 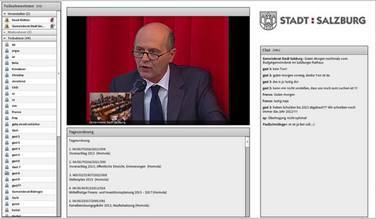 Jochen Höfferer has started to broadcast live and interactively the meetings of the city council in Salzburg, Austria.